It is commonly understood that, far from representing a bygone age, P.G. Wodehouse created an idealised England that never really existed. Yet I remain determined to find fragments of Wodehouse’s world in real life, and last October I immigrated to England in search of Plumtopia. I arrived in time for a glorious Autumn – my favourite season. Surprisingly, Wodehouse sets only one novel in Autumn that I can recall. So says Bertie Wooster, with a little help from Tennyson, in The Inimitable Jeeves (1923). The story was originally published in ‘The Strand’ magazine as Jeeves in the Springtime (1921) and is among his finest and best loved. 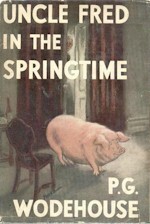 Earlier, Wodehouse had contributed lyrics for the Broadway musical Miss Springtime (1916) and he continued the spring motif with novels Uncle Fred in the Springtime (1939) and Spring Fever (1948). In his other work, Spring is arguably the default season. The sunshine of a fair Spring morning fell graciously upon London town. Out in Piccadilly its heartening warmth seemed to infuse into traffic and pedestrians alike a novel jauntiness, so that bus-drivers jested and even the lips of chauffeurs uncurled into not unkindly smiles. Policemen whistled at their posts, clerks on their way to work, beggars approached the task of trying to persuade perfect strangers to bear the burden of their maintenance with that optimistic vim which makes all the difference. It was one of those happy mornings. This passage neatly expresses a kind of shared joviality that I’ve witnessed in England, when the sun blesses us unexpectedly on a Spring morning. At Blandings Castle it’s usually Spring, with the Shropshire Agricultural Show keenly anticipated, or it’s Summer. Leave it to Psmith (1923) begins precisely on 30 June ‘…which is the very high-tide time of summer flowers’, and the cast return (without Psmith) in Summer Lightning (1929). In Pigs Have Wings (1952) the ‘sultry summer’ heat prevents Maudie Stubbs from walking to Matchingham Hall to settle a grievance with Sir Gregory Parsloe-Parsloe. 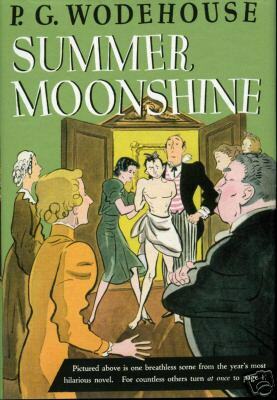 Beyond Blandings, Wodehouse gave us Summer Moonshine (1937), and in Right-Ho Jeeves (1934) Bertie tells us it is ‘July twenty-fifth’ when he returns from a trip to Cannes ‘looking bronzed and fit’. Although we can’t always be sure of the season, it’s clear that Wodehouse, unlike the great Russian novelists, prefers to bask his characters in sunshine and light. In The Mating Season (1949), Bertie must catch a 2.45am Milk Train and hides in the shrubbery outside The Larches, Wimbledon Common to intercept the morning post. He complains bitterly about this experience, not least the beetles down his back, but his author resists the literary tradition of meteorological symbolism. Though howling hurricanes and driving rainstorms would have been a more suitable accompaniment to the run of the action, the morning – or morn , if you prefer to string along with Aunt Charlotte – was bright and fair. My nervous system was seriously disordered, and one of God’s less likeable creatures with about a hundred and fourteen legs had crawled down the back of my neck and was doing its daily dozen on the sensitive skin, but did Nature care? Not a hoot. The sky continued blue, and the fat-headed sun which I have mentioned shone smilingly throughout. Even in trying of circumstances, the V-shaped depressions are usually metaphorical. If somebody had told Frederick Fitch-Fitch at that moment that even now a V-shaped depression was coming along which would shortly blacken the skies and lower the general tempera­ture to freezing-point, he would not have believed him. And quaffs mayhap the warming beaker. He reads his Wisden on the sofa. Perhaps this last extract best explains Plum’s fondness for the warmer sporting months, when school is out and there’s cricket, tennis or golf to be played. So many of Wodehouse’s best scenes occur outside – it’s little wonder he chose not to limit his characters to rainy days indoors. But how wonderful it would be to have a peep into Wodehouse’s world all year round. ‘It was one of those still evenings you get in the summer, when you can hear a snail clear its throat a mile away.’ (‘Jeeves takes charge) reminded me of this previous piece on Wodehouse through the seasons. Rhyming “oaf. A” with sofa Is pure genius. Plum at his most magnificent in the line of poetry. Great piece overall; thanks. Thanks Ken. I love ‘Oaf. A’ and ‘sofa’ too! Wow, I cannot believe you actually shifted home just to search for a vision that you conjured from Wodehouse’s writing. I find his world so enamouring and such a beautiful escape from reality that it is truly refreshing. Once upon a time, me and my sister were so smitten by it that all our dialogues became Wodehousian- especially the repartees, not to mention when we referred to others. Thank you for putting me up midst the gang of the madcaps- will try to live up to the spirit, for it is quite infectious. Thanks for the lovely comment Prateeksha. It wasn’t just Wodehouse that led me to England. Obviously the weather was an enticement. It’s also nice being in a place where you can talk Wodehouse. Spring is also the time when a young man’s thoughts turn to love – I do not recall this one is from which narrative of his, but find it highly intoxicating! Like in so many other realms of knowledge, Plum displays great expertise in being a meteorologist as well. A sunny piece, as always! What Ho! What Ho! Ashokbhatia. I don’t know which story the line is from, but it sounds very Wodehouse. So it is. Wish to re-blog this piece pretty soon! Very kind of you. Pip pip, old bean. I like to believe it was existed too. It is, of course, like when ex-pats return here after many years away and complain the country of their memories isn’t here anymore. The world of Wodehouse exists in his unique stories, and I enjoy my visits there immensely. A good point. I don’t think the world was ever as delightful as Wodehouse depicted it, but… I like to think, or hope, that we may still find — even create — pockets of delight. Happily we can also escape into Wodehouse when the going gets tough. Thanks for sharing this, Ashokbhatia. Much appreciated. ‘Something Fresh’ has a juicy description of a harsh wintry night, when Ashe Marson travels from the train station to his new place of work! Aha — well spotted Ashok Bhatia! Try Something New…. Joan Valentine was a tall girl with wheat-gold hair and eyes as brightly blue as a November sky when the sun is shining on a frosty world. There was in them a little of November’s cold glitter, too, for Joan had been through much in the last few years; and experience, even though it does not harden, erects a defensive barrier between its children and the world. I think there is a golf story that is, at least partly, set in winter and Another Christmas Carol, of course. The latter is hard to find in print, but there is a reading of it on Youtube, called Wodehouse Christmas. The golf story Stefan mentions is probably Feet of Clay in the Nothing Serious collection.